The JPA, as lead agency, has completed the Final Environmental Impact Report (FEIR) for the W-19 Restoration Project as required by the California Environmental Quality Act (CEQA). The responses to public comments received on the Draft EIR are in Appendix R of the Final EIR. Both the Final EIR and appendices including Appendix R are available for download provided at the links below. 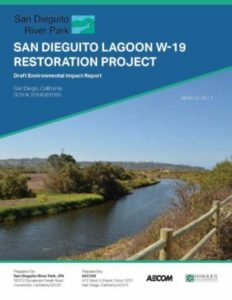 The W-19 restoration project would supplement recent restoration efforts within San Dieguito Lagoon by establishing wetland habitat within a specific portion of the lagoon system, referred to as W-19. The proposed project encompasses approximately 141 acres of land adjacent to the San Dieguito River and wetland habitats. The W-19 site is identified as an area for restoration opportunity by the JPA in the Park Master Plan for the Coastal Area of the San Dieguito River Valley Regional Open Space Park (Park Master Plan). The I-5 North Coast Corridor Public Works Plan/Transportation and Resource Enhancement Program (PWP/TREP) identifies the site as part of the overall wetland mitigation strategy for infrastructure projects along the I-5 North Coast Corridor within northern San Diego County. Restoration within W-19 is also anticipated to be used as mitigation for the City of San Diego’s El Camino Real Bridge Replacement Project. The goal is to establish a system with approximately 50 acres of tidal wetland and 15 acres of brackish wetland, as well as create and/or enhance approximately 5 acres of riparian habitat. Other areas would be established as transitional areas and native uplands. Due to file size limitations, some of the appendices are divided into multiple smaller files.